Egyptology Today examines how modern scholars examine all aspects of ancient Egypt, one of the greatest of all ancient civilizations. In essays by a team of archaeologists, curators, scholars, and conservators who are actively involved in research or applied aspects of Egyptology, this book looks at the techniques and methods that are used to increase our understanding of a distant culture that was as old to the Greeks and Romans as these cultures are to us. Topics range from how tombs and other monuments are discovered, excavated, recorded and preserved, to the study of Egyptian history, art, artifacts, and texts. Each chapter shows how modern Egyptology approaches, learns about, and strives to preserve the ancient remains of one of the most fascinating cultures in human history. 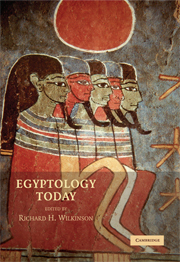 Introduction: the past in the present: Egyptology today Richard H. Wilkinson; Part I. Methods: Paths to the Past: 1. Archaeology and Egyptology Kent Weeks; 2. History and Egyptology Donald Redford; 3. Medical science and Egyptology A. Rosalie David; Part II. Monuments: Structures for this Life and the Next: 4. Site survey in Egyptology Sarah Parcak; 5. Epigraphy and recording Peter Dorman; 6. Monument and site conservation Michael Jones; Part III. Art and Artifacts: Objects as Subject: 7. Art of ancient Egypt Rita Freed; 8. Ancient Egypt in museums today Arielle Kozloff; 9. Artifact conservation and Egyptology Susanne Gansicke; Part IV. Texts: The Words of Gods and Men: 10. The Egyptian language James P. Allen; 11. Ancient Egyptian literature John L. Foster and Ann L. Foster; 12. Egyptian religious texts Ronald Leprohon; Afterword: the past in the future: tomorrow's Egyptology Richard H. Wilkinson.